Wolves Once Lived in all 50 States. They were exterminated primarily by ranchers and farmers, and early settlers who brought their fear of wolves from Europe to America. They now exist in abundance in the U.S. only in Alaska and Minnesota. Due to reintroduction programs, wolves now live in limited numbers in Arizona, Idaho, Michigan, Montana, New Mexico, Wisconsin, and Wyoming. Even now in the year 2010 most of these States are still intent on eliminating wolves. Sadly, in 2011, a congress placed a budget rider in an appropriations bill that delisted wolves in much of the county, which the President signed into law. 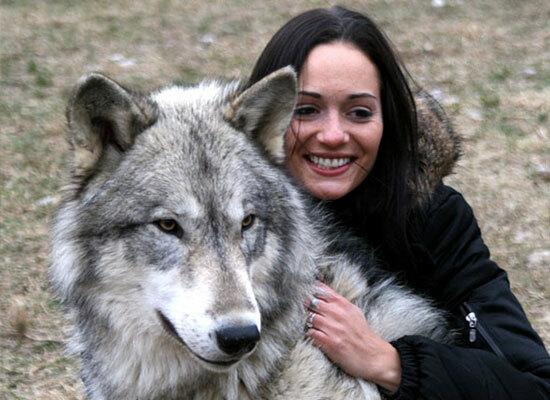 This rider, having nothing to do with scientific realties of wolf recovery and everything to do with political brinkmanship, was slipped in a budget bill during hard economic times where it would not be challenged, mostly to help certain politicians get elected in States which are not wolf friendly. As a result hunting seasons now exist in Wyoming, Montana & Idaho, with hundreds of wolves already killed in regions they were never very abundant. Several wolves were killed immediately after they strayed over the border of Yellowstone National Park, their electronic tracking collars turned over to federal Fish & Wildlife agents by the shooters. These animals were not able to read the signs that they were leaving the park. Now here in 2013, political powers want to delist wolves in the rest of the lower 48 states, including Michigan and Minnesota where wolves have lived without threat for hundreds of years, coexisting without issue with people, ranchers, and hunters. Again, science does not support hunting of wolves, but politicians still intend to circumvent scientific reality….this time by not allowing a peer-reviewed analysis of the delisting proposal, instead trying to have the proposal rubber stamped by political appointees. The efforts of people like you, who have signed petitions to stop this, have resulted in the U.S. Fish & Wildlife suspending temporarily the analysis of the delisting proposal. But they are just waiting for you to go away. Do not let them get away with it a second time. All those annoying requests you get to sign petitions really do make a difference. Also, consider starting a petition yourself on a State/local level with your own Senator or U.S. Congressman. It’s difficult to believe at times, but your voice is heard by those who want your vote.